"Our corporate real estate team continues to deliver world-class results in building campuses that reflect our employees’ spirit of teamwork, collaboration and passion for their work. 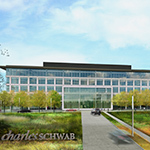 But above all, they are simply great places to work"
AUSTIN, Texas--(BUSINESS WIRE)--This morning, Charles Schwab & Co., Inc., is celebrating construction progress at its new Austin campus at 2309 Gracy Farms Lane. Texas Governor Greg Abbott and Austin Mayor Steve Adler are among the officials joining Schwab executives in signing the beam that will then be hoisted by crane to the top of the site’s second office building, currently under construction. The “topping out” ceremony celebrates Schwab’s growth in Austin, and in the state of Texas as a whole. Over the past two and a half years, Schwab has brought roughly 600 jobs to Austin alone. 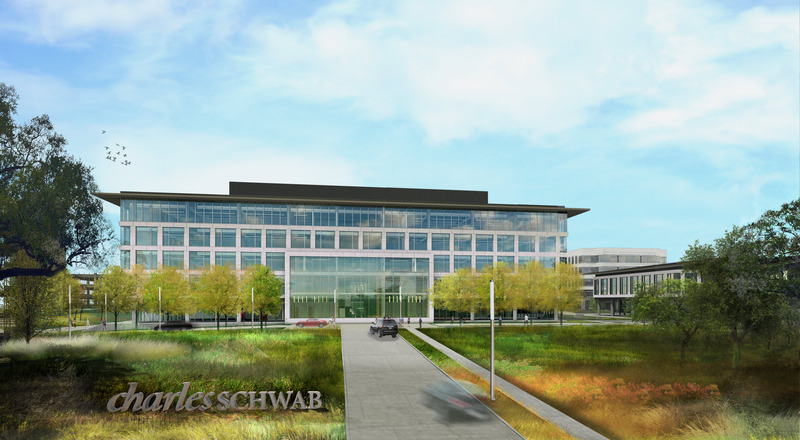 A total of approximately 1,000 of Schwab’s Austin employees, currently at an existing facility at Research Park, will move into the 469,000-square-foot, 50-acre Gracy Farms campus by June 2018, once the new campus is fully completed, joining the 600 employees who moved on site in the spring of 2016. Upon completion, the campus will include two five-story office buildings (one of which is the fully renovated former Tivoli building), an amenity building containing a café and large assembly space/training center, and a parking garage. Located in a highly visible, desirable location close to the Domain, a popular shopping area with restaurants, boutiques and other amenities, the Gracy Farms campus is easily accessible from all points within the Austin metropolitan area. As with other Schwab developments, the new Austin campus was designed to create a sustainable, visually appealing and strong identity within the community. The site and buildings will all incorporate sustainable materials and systems, targeting LEED (Leadership in Energy and Environmental Design) Gold certification. While San Francisco remains Schwab’s corporate headquarters, Austin is one of ten geographically important employment centers for the company. Three of these centers are in Texas. Schwab has approximately 16,000 employees nationwide, of whom approximately 2,100 are in the Lone Star State. The company’s major employment centers, ranked by size (largest to smallest), are Phoenix, Denver, Austin, San Francisco, Orlando, Indianapolis, Richfield (Ohio), Chicago, El Paso and Dallas (Schwab’s newest growth market). In addition, Schwab has more than 325 retail branch offices across the United States, and also provides 24/7 phone service via live representatives 365 days a year. Schwab has been in Texas since 1977 when the company opened its first Texas branch office in Dallas. The state now has 22 Schwab branch offices, two of which are in Austin. The company opened its service center in Austin in 2000. Local Austin employees now work across a wide range of business functions, including Schwab Technology Services, Schwab Investor Services, Schwab Advisor Services, Retirement Plan Services, marketing, human resources, and legal and compliance. Schwab has been named a Top Workplace in Austin by the Austin American-Statesman since 2013, and was recently named one of the Best Companies to Work for in Texas by Texas Monthly magazine. Nationally, Schwab has been recognized as a Best Place to Work for LGBT equality (100 percent rating on the Human Rights Campaign’s Corporate Equality Index since 2004) and as one of the FORTUNE “World's Most Admired Companies®” 2016. For five consecutive years, Schwab has received the Gallup Great Workplace Award. For information about careers at Schwab, visit www.aboutschwab.com/careers. FORTUNE and The World's Most Admired Companies are registered trademarks of Time Inc. and are used under license. FORTUNE and Time Inc. are not affiliated with, and do not endorse products or services of Charles Schwab & Co., Inc.